Possibly London, Society of Painters in Water-Colours, 1825, no, 194 as 'The Gardener'. The present drawing is an early work in Hunt's oeuvre, typified by his use of a reed pen, the use of which is attributable to his early days in the Monro Academy and the copying of a series of drawings by Canaletto. 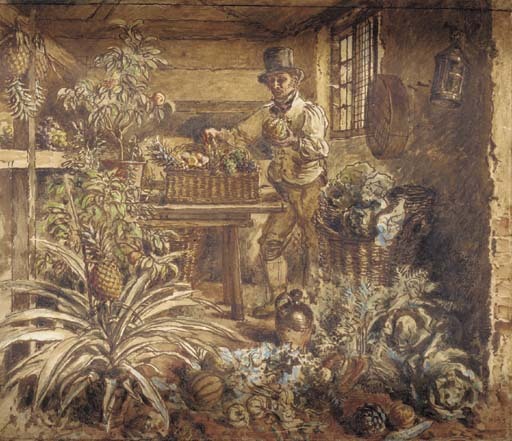 A comparable drawing, which appears to use the same model, entitled The Flower Seller is illustrated J. Witt, William Henry Hunt (1790-1864) Life and Work, with a Catalogue, London, 1982, p. 173, no. 324, pl. 35 and is dated to circa 1825. An upright drawing, executed on the same size sheet, and using the same model was sold Bonhams, London, 7 July 1993, lot 48 (£9,200). Christie's Interest in Property Consigned for Auction. From time to time, Christie's may offer a lot which it or an affiliate owns in whole or in part. This is such a lot.